During my ham years I have tried many times to build various antennas, sometimes succeeding, other times failing. But that's what it is all about, isn't it? Here are a recent success story. When APRS came around I needed a good 2 m antenna for my summer QTH which is at the sea. So it should be sturdy and easy built. I went for the 'Slim Jim'. Tnx OH6MH for the hint! If you click the image, you will find a story about how I actually made it (only in finnsh, sri, but lots of pictures). 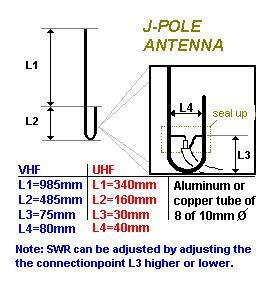 Above is another antenna which I intend to build a couple of this winter: The J-pole. It is not mechanically as sturdy as the Slim Jim, but works equally well I am told. This APRS stuff is calling for more digipeaters, especially at the coast, where people are using 2 m gear and GPS's in their boats. So our club, OH6AG, is planning to get a digi up here!